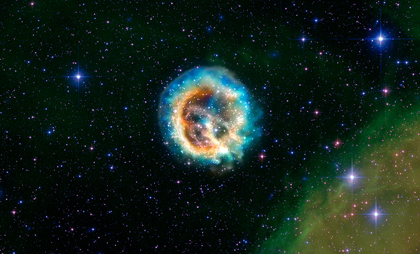 This image of the debris of an exploded star - known as supernova remnant 1E 0102.2-7219, or "E0102" for short - features data from NASA's Chandra X-ray Observatory. E0102 is located about 190,000 light years away in the Small Magellanic Cloud, one of the nearest galaxies to the Milky Way. It was created when a star that was much more massive than the Sun exploded, an event that would have been visible from the Southern Hemisphere of the Earth over 1000 years ago.